What Should Be Done With the Flowers of the Epitaphion on Holy Friday? 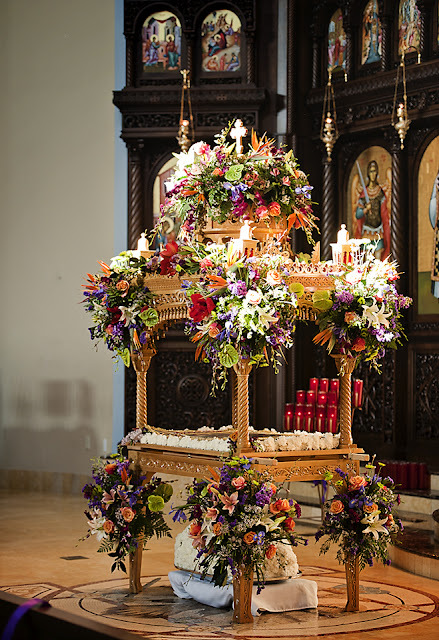 There is no rule about what should be done with the flowers from the epitaphion (or kouvouklion if you want to be more precise) on Holy Friday. The usual practice is to strip the epitaphion of most of the flowers on Holy Friday after the service and distribute the flowers to the faithful. This is fine, but I personally like an old Greek custom that is still practiced among many parishes in Greece and especially Cyprus. According to this Greek/Cypriot custom, all the flowers from the epitaphion are not removed after the Holy Friday evening service. Instead, they remain decorated on the epitaphion, which is placed in some area of the church or narthex, until the Saturday before Pentecost, which is the final Saturday of Souls of the year. During this time the kouvouklion is still decorated with the flowers, while in the center is placed an icon of the Descent into Hades together with a perpetually lit oil lamp. Then on the Saturday of Souls, after the Divine Liturgy, the dried up petals are taken and put in small bags to be distributed to the faithful together with the antidoron on the Sunday of Pentecost as a blessing. These dried up petals will then be used by the faithful at their local cemetery, at the graves of their loved ones, where they will be burnt like incense in a censer to bless the grave. These petals can also be used by the priests, when they are called to do a Trisagion at the graves of parishioners. Since these petals symbolize the life coming from the tomb of Christ, it is a beautiful tradition that transfers the symbolic imagery and the hope of the resurrection to the graves of our loved ones. However, parishioners will naturally want to take some flowers on Holy Friday from the epitaphion as a blessing for their homes. 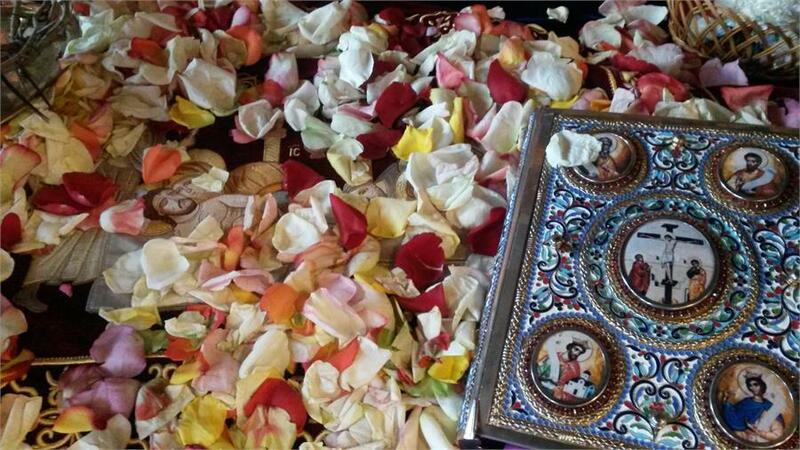 For this reason a priest can have extra rose petals spread over the epitaphion cloth, then after the service he can take those petals and distribute them to the faithful. Furthermore, the candles from the kouvouklion can be offered by the priest as a blessing in special circumstances, such as to someone who is ill, a student, a farmer, etc.